FoodMaven finds value in recovered food for restaurants, retailers and suppliers. More than $160 billion in food is wasted in the U.S. every year, though many Americans go hungry. Much of that wasted food ends up in landfills, where it rots and generates methane, a powerful greenhouse gas. It’s a problem. But to Patrick Bultema, the solution is a business opportunity—one that can save restaurants and suppliers money and at the same time feed those in need. Bultema is the CEO and co-founder of FoodMaven, a Colorado Springs, Colo.-based online marketplace and logistics network that is attempting to recapture that lost food. 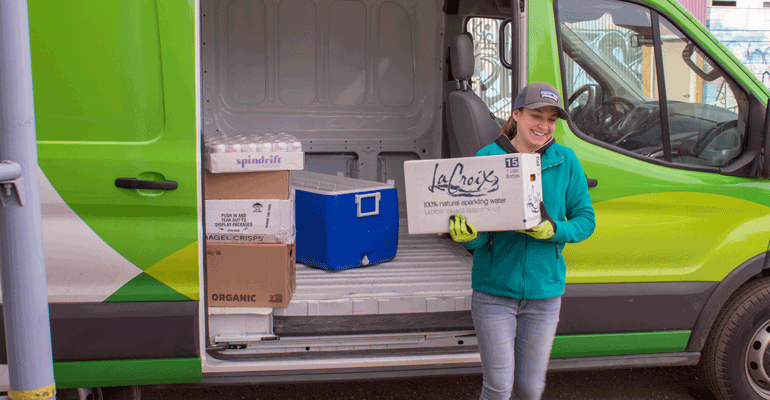 FoodMaven captures the oversupply from places like large grocery distribution centers, and works with local suppliers, such as farmers or producers who have no pipeline to local restaurants. Much of what the company sells are “imperfects,” or produce that’s too small, too big or oddly shaped but perfectly good to eat. FoodMaven takes care of pickup and delivery. When product sells, FoodMaven shares the revenue from the sale with the supplier. The split varies. FoodMaven takes a lower percentage for proteins, for example, but a higher percentage for produce with a shorter shelf life. On average, FoodMaven keeps about 40 percent. When product doesn’t sell, it’s donated to hunger relief organizations, and food that can’t be sold or donated ends up as animal feed or alternative fuel at farms or biogas plants. The tax credit for the donation goes back to the original supplier. Essentially, “we created economic incentive for people to bring food to us that’s otherwise getting lost,” said Bultema. For restaurants, “our value proposition is: We’ll get them equal to or better quality of product at about half price, with the same kind of service that they would expect from other suppliers,” said Bultema. The Colorado-based company has 800 local clients including suppliers, restaurants, institutional and commercial kitchens. Restaurant owners who log on to FoodMaven find everything from boneless skinless chicken breasts to yak meat, for example. There’s butterhead lettuce that’s a bit smaller than standard size or local potatoes that haven’t been processed yet. FoodMaven has struck a chord with restaurant owners and food-service providers who appreciate finding unusual and affordable goods, said Bultema. Chefs and restaurant operators are also attracted to the company’s zero-landfill policy, he said. Jeff Fryer, the chef at Colorado Springs-based pub Alchemy, said he likes the “inspiration aspects” of working with FoodMaven. Due to the nature of how FoodMaven obtains its product, the company also has the ability to offer goods in smaller quantities. This can help restaurateurs test out new ingredients or specials without a big commitment. This summer, Alchemy tested out beef hearts in a queso dish and in a watermelon salad. Fryer also serves local cheeses from FoodMaven. “It helps them maintain that zero-food waste. It helps keep us with new and mostly locally sourced items. And it helps the customers to get something different that they’re not used to, so I think it’s helping everyone,” said Fryer. FoodMaven’s service is available only in Colorado for now. But Bultema plans to expand to other major metro areas across the country. The venture-fund-backed company has raised nearly $10 million. Investors include former Whole Foods Market co-CEO Walter Robb and the Walton family, heirs to the Walmart retail chain.